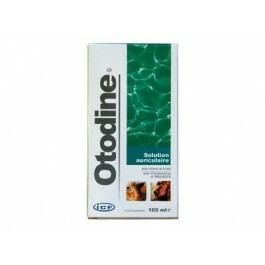 Otodine solution is an ear cleaning solution for dogs and cats containing chlorhexidine. 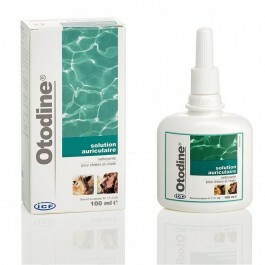 Otodine® is an ear cleaning solution with a patented formula, which incorporates the dual action of Chlorhexidine digluconate and TrisEDTA, both effective antibacterial agents. Otodine®can also be used to flush out minor wounds and abscesses. Can be used as a pre-treatment cleanser. Can be used as a maintenance cleanser where bacteria have been identified by cytology or culture. Chlorhexidine digluconate has an antibacterial action and is not deactivated by organic debris. TrisEDTA has a synergistic effect with chlorhexidine digluconate, Ethylenediaminetetraacetic acid (EDTA) has an antibacterial action, and buffer solutions containing tromethamine (Tris) have been used to increase this action. For best effect, it is important to buffer EDTA solutions to pH8 and to compound EDTA with tromethamine (Tris). Use Otodine® twice daily for at least 14 days. Wash and clean the auricular canal and pinna. Do not touch the skin with the tip of the bottle. Pour Otodine® into the auricular canal until the canal is completely filled. Massage the base of the external ear canal (cartilage) for at least one minute to allow the solution to reach the bottom of the canal. Leave to work for a few minutes. Dry the ear canal carefully with a cotton ball or gauze and completely remove the residual debris.